A former sumo wrestler, Goto debuted in All Japan in 1981. In 1983 he won the puroresu rookie award. In 1989 Goto moved to FMW and would work for the company until 1995, when he moved to IWA Japan. 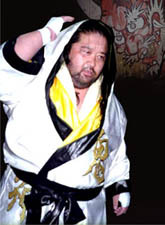 In the early 90s Goto captured both the single and tag team FMW Brass Knuckles Championship, reaching the peak of his career by becoming a deathmatch specialist and working some of the most famous deathmatches ever tagging with Onita, including the infamous flaming ropes deathmatch vs Sabu and the Sheik. After he left FMW, Tarzan Goto slowly started to be more and more sidelined on the puroresu scene. His latest notable appearance in a large venue happened in 2005 at the Korakuen hall working for Kings Road. In 2006 Goto opened his own small promotions, called Goto Ippa at the “Asakusa Fight Club,” a restaurant of Goto’s property.